We here at the Society of St. Cassian celebrate his feast-day on July 23rd according to the Ordo Kalendar of the Order of Julian of Norwich (www.ORDEROFJULIAN.ORG). Synaxis Press has published “The Spirituality of John Cassian” by Ron Samuel Dart ($17.00). 1.) He insists that Grace is the source, path and end of man’s journey. 2.) Cassian believes that a spiritual director (staretz) is vital to growth. 3.) Cassian is open to the charismatic gifts and feels they are vital. 4.) Cassian sees Holy Scripture as the Word of God. Especially the Psalter and Wisdom Literature. 5.) He feels prayer is central to Christianity. He is the advocate of prayer without ceasing. 6.) Without community, deep inner unity with fellow Christians is limited. 7.) He practices many levels of exegesis: literal-historical, moral-theological, and allegorical. 9.) Cassian saw spirituality and theology as twins in the divine family. 10.) Without Love man can do nothing. Throughout history St. Cassian has exerted a powerful force. His ideals shaped the Benedictine rule which is the textbook of monasticism. 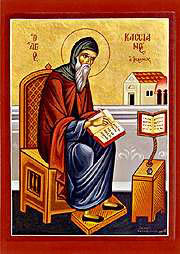 St. Benedict recommended that his monks read daily the Conferences of St John Cassian. God bless you all during this long hot Summer of 2012.